Didn’t Japan do anything evil? I expane about Japan. It does not mean that Japan has not done anything evil. However, the bad image placed on Japan is much greater than the reality. 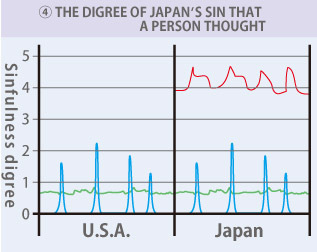 This diagram shows how Japan is seen evil compared with the U.S. in the Pacific War (II World War). Of course it all depends on peoples how they feel. 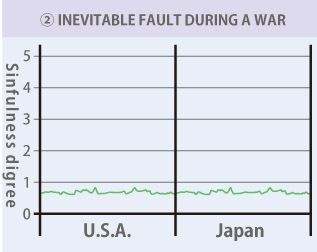 But here is a rough indication which is shown in the graph. But please do not simplify everything, thinking that war itself is evil so everything is evil. It is considered legal to cause a war or kill people if you follow the international law. 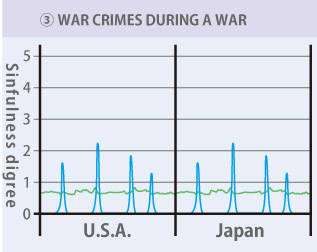 The green line in the second diagram shows minus parts in the war, which is inevitable such as accidental bombing or appearance of refugees. That means that any country has committed this degree of mistakes or evil deeds. The 3rd diagram deals with war crimes, such as abuse of the hostages or massacre etc. Sad to say, these things could happen, because it is not an ordinary time. Concerning this, let’s say that the amount is about the same in Japan as the U.S. In this 4th diagram, I had some people write how much war crimes or evil Japan may have committed, besides all that I have explained so far. 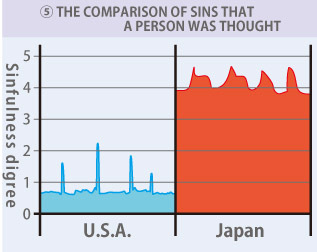 In short, when Japan is compared with the U.S. , the difference may look like the difference of red area and blue area for some people. Let’s get back to the beginning.